Susan is absolutely one of our most favourite artists. Whatever she graces with her unique style really jumps off the screen! This classic scene from Colorado is no exception. It may not be to everyone's taste, but we think this polygon style art is quite special. Many more examples of Paul Vera-Broadbent's iPad and iPhone art can be found on his site and Flickr page. Iszy has been busy. Early last month he completed a personal project, to create one colour sketch each day for 30 days using only the iPad. We think Iszy's done a stellar job with every painting, especially given the restrictions he placed upon himself. Head on over to Into The Isyverse for plenty more iPad related blog posts. We'll be keeping a close eye on Iszy's work. He's currently using Sketchbook Pro and Brushes. Recent updates to both ArtRage and SketchBook Pro have finally pushed through the multi megapixel canvas barrier. SketchBook Pro struck first on May 13 with an optional high resolution canvas of 2048 x 1536, but then ArtRage hit back on May 27 with an unprecedented 2048 x 2048 canvas. That's a whopping 4 million pixels! Both multi megapixel canvas options are limited to iPad 2 users and both have a performance hit. We haven't done any exhaustive testing to see just how much of a performance hit is present on each app, but it might be enough to make some of you think twice. That in our opinion would be a shame. Head back here tomorrow when we'll explain why these new multi megapixel canvas options are so important and why we think you should consider using them. Many thanks to reader ﻿Bill Pham for the heads-up regarding the SketchBook Pro update. Much appreciated Bill. SketchBook painters, a chance to showcase your art! AutoDesk are currently in the planned stage of a public exhibition to showcase 'the diversity of art and creativity of SketchBook users'. They are looking for all types of artwork and illustrations from across the entire range of SketchBook products, including SketchBook Pro and SketchBook Express for the iPad. We are certain that many of our readers, and those that kindly share they artwork in the iPad Creative Flickr group, would love the chance to see their creations displayed in a public exhibition hosted by AutoDesk. To be considered you'll need to follow the instructions here, but don't forget that you only have until Thursday, 24th March (5PM PST) to get your entries emailed to AutoDesk. Be sure to let us know if you get accepted! An artist going by the YouTube user name of 'asuka111digiemo' has uploaded this beautiful painting video. The artist uses Sketchbook Pro and Brushes to great effect. We especially enjoyed watching the layering of shadows and highlights. Thanks for sharing! If you use Autodesk's Sketchbook Mobile on your iPhone or Sketchbook Pro on your iPad you will be seeing a lot of this image in future. Drawn by Spanish artist Luis Peso using Sketchbook Pro on his iPad, "Progress" is going to be the new splash screen on the more than 2 million downloaded copies of Sketchbook Mobile. Luis entered the SketchBook Hero competition we told you about a few months ago and his image was selected as winner over a whole host of other artists images from many different countries. You can see a lot more of Luis' work on his Flickr stream and he is also an active member of our iPad Creative Flickr group. Be sure to check out the link to see more examples of stunning artwork created on the iPad. If you don't already have a copy, Sketchbook Pro for iPad is on sale now for $2.99 (£1.79) and the iPhone version is only $0.99 (59p). The video below, released around the time of the iPad launch, shows Sketchbook Pro in action. You may have seen this already but we just wanted to make sure you hadn't missed this one from David Newman. As 'Silicon Valley's artist-in-residence', Newman has been using Macs since the early 80's and more recently the iPad to create some wonderful paintings and his latest subject, Steve Wozniak, is going to appeal to Apple geeks everywhere. 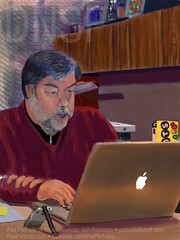 Woz himself, on his Facebook page, said it is the "Best photo or painting of me ever!" and he is now using it as his profile pic. Woz also explains in another post that Newman took a screenshot of his SketchBook Pro workflow every 3 minutes to create key frames for the video above. It is fun how Newman deconstructs the picture at the end of the video too, reminding us of the steps he took to get there (and how he starts with Woz's name as the background). We love seeing the creative process in action like this, showing how an artist layers up an image and creates light and shapes to construct their image. It is something that we could never appreciate fully from just looking at the final piece and we are grateful to all the artists who are sharing their creative processes for the rest of us to wonder at. Newman's work is amongst the 4,700 plus images submitted to our iPad Creative Art and Design Flickr Group, check out the rest of the images too, there are some amazing pieces there.